UQ researchers propose that when vitamin D levels drop, certain enzymes become unchecked and begin to break down perineuronal nets. (Nick Valmas, UQ)Dr Burne’s team propose that vitamin D plays an important role in keeping perineuronal nets stable, and that when vitamin D levels drop, this ‘scaffolding’ is more easily degraded by enzymes. “It’s like the canary in the coalmine—it might fail first because its high energy requirement makes it more sensitive to the depletion of essential nutrients like vitamin D.
Vagus nerve illustrated in yellow. Vagus nerve stimulation (VNS) enhances targeted neuroplasticity, helping the brain build stronger neural connections after a stroke, according to pioneering research from the University of Texas at Dallas. Using an animal model, the researchers have demonstrated for the first time that pairing VNS with a physical therapy task accelerates the recovery of motor skills. The researchers published their findings, “Vagus Nerve Stimulation Enhances Stable Plasticity and Generalization of Stroke Recovery,” in the journal Stroke. A human clinical trial of the same treatment, “Pivotal Study of VNS During Rehab After Stroke (VNS-REHAB),” is currently underway at 18 research sites across the US and in the UK. The goal of the study is to gauge the efficacy of paired vagus nerve stimulation in helping stroke patients recover motor skills more quickly. Vagus nerve stimulation is delivered via a small, surgically implanted device that uses electrical impulses of varying intensities and pulse-widths to activate the vagus nerve. Electrical stimulation of the vagus nerve using VNS is an FDA-approved treatment for drug-resistant epilepsy and treatment-resistant depression. A recent proof-of-concept human study also found that VNS is a viable treatment for inflammatory joint diseases such as rheumatoid arthritis. The sudden loss of blood flow after a stroke causes neurons in any stroke-affected brain region to die, which cuts off connections to other nerve cells. The loss of motor skills in an arm or leg after a stroke is caused by a loss of connectivity between nerve cells in the limb with corresponding motor regions of the brain. Using an animal model, the UT Dallas researchers found that brief bursts of VNS strengthen communication pathways by building stronger cell connections in the brain after a stroke. In fact, their results show that coupling VNS with targeted movement therapies dramatically boosts the benefit of rehabilitative training after a stroke. And, in animal studies, these improvements lasted for months after the completion of VNS targeted therapy. Michael Kilgard, associate director of the Texas Biomedical Device Center and professor of neuroscience in the School of Behavioral and Brain Sciences at UT Dallas, was a senior co-author of this research. Kilgard is the principal investigator at the UTD Cortical Plasticity Laboratory. His teamalso includes Seth Hays, a postdoctoral researcher in the School of Behavioral and Brain Sciences at UT Dallas, who specializes in targeted plasticity therapy to alleviate motor dysfunction. Another recent study from UT Dallas found that moderate intensity vagus nerve stimulation optimized the neuroplasticity-enhancing and memory-enhancing effects of VNS more effectively than low or high-intensity stimulation. Notably, the researchers pinpointed that the optimal pulse width and current intensity were marked by an “inverted-U” pattern in which too much or too little VNS was less effective than a ‘Goldilocks’ sweet spot of moderate intensity that was just right. These 2017 findings were published in the journal Brain Stimulation. In 2017, the makers of a vagus nerve stimulation device launched a randomized, double-blind clinical trial of VNS rehab for patients after a cerebrovascular stroke. This study, currently underway, will include up to 120 subjects at 18 clinical locations across the US and in the UK. The estimated conclusion date of preliminary research for this clinical trial is June 30, 2019. The Ohio State University is one of the institutions participating in the paired VNS clinical trial. Marcie Bockbrader of the Wexner Medical Center at OSU is their principal investigator for the trial. For this clinical trial, each study participant receives three one-hour sessions of intensive physiotherapy per week for a total of six weeks. The goal is to improve task-specific motor arm function. Half of the group participating in this clinical trial had a vagus nerve stimulation device surgically implanted; the other half will serve as a control group. During each rehabilitation therapy session, whenever a patient correctly performs a particular motor skill, the therapist pushes a button to trigger an optimal pulse width and current intensity of vagus nerve stimulation. The hypothesis is that if precise and accurate movements are positively reinforced by a brief burst of VNS during a trial-and-error learning process that these actions become “hardwired” into the brain more quickly. “We are trying to see if this neurostimulator could be used to boost the effective therapy, creating a sort of ‘supercharged therapy.’ We want to determine if patients can recover more quickly through the use of this stimulation,” Bockbrader concluded. Most biological tissues routinely replace old cells with new ones. Unlike other tissues, the nervous system–being the most complex biological device found in nature–uniquely maintains most of its neurons throughout life and replaces relatively few. 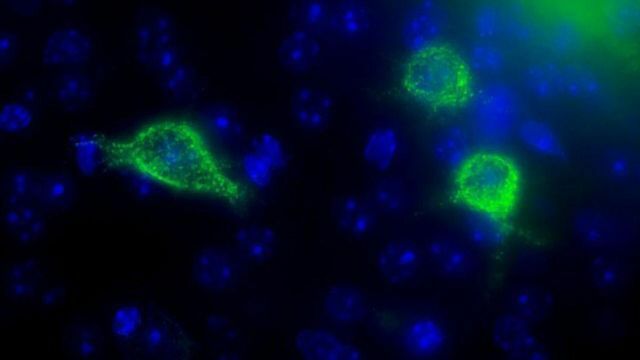 It preserves hotspots where it generates new neurons from resident stem cells during adulthood in a process known as adult neurogenesis, which varies among different species in its features, dynamics, and regulation. In spite of its widespread prevalence in the animal kingdom, the preponderance of studies conducted on a few laboratory rodent species such as rats and mice limits our understanding of the evolution, regulation, and function of adult neurogenesis. The anatomy, complexity and functions of the brain vary greatly in the animal kingdom: striking differences exist from simple bilaterians to humans, and, to a lesser extent, also among mammals. Therefore, both comparative and focused studies on different species will shed more light on the origin, development, and purpose of adult neurogenesis. Adult neurogenesis was discovered and described by Joseph Altman and Das in rats (Altman and Das, 1965) and has been investigated in many species such as the zebrafish, frog, songbird, mole, mole-rat, vole, bat, fox, dog, dolphin, elephant, shrew, rabbit, monkey, and human. With the development of genetic manipulation techniques, researchers have focused largely on inbred laboratory rodents. While this provides a strong advantage of restricting genetic variation in the group, it also narrows our perspective on adult neurogenesis as a biological phenomenon (Bolker, 2017). Moreover, the rapid development of genetic tools has made Mus musculus the species of choice in studying adult neurogenesis. Yet, many unsolved issues and open questions cannot be resolved without the contribution of comparative studies spanning through widely different species. Such issues involve: how did adult neurogenesis evolve, whether our survival depend on adult neurogenesis, what is the link between adult neurogenesis and brain complexity, how do adult neurogenesis and animal behavior influence each other, how does adult neurogenesis contribute to brain plasticity, cognition and, possibly, repair, and how do experimental conditions affect adult neurogenesis. Studying unconventional species will give us insights into the evolution and function of the brain, strengthening our understanding of the cellular basis of cognition and behavior, thus helping adult neurogenesis to find its place in the puzzle. With this Research Topic we, along with contributors from different areas, tried to answer the open questions and to encourage engaging discussions on the comparative and evolutionary aspects of adult neurogenesis. The diversity in adult neurogenesis indeed spans the de-novo formation of the entire adult brain in planaria (Brown and Pearson), neurogenesis in diverse brain areas in fish (Olivera-Pasilio et al. ), reptiles (LaDage et al. ; Lutterschmidt et al. ), and birds (Barkan et al. ; Kosubek-Langer et al.) to animals with restricted neurogenic niches such as invertebrates (Beltz and Benton; Simões and Rhiner) and mammals (Taylor et al. ; Lévy et al. ; Oosthuizen; Wiget et al.). The striking differences do not only concern the sites of occurrence and relative amounts (Brown and Pearson; Lévy et al. ; Olivera-Pasilio et al. ; Wiget et al.) but also in mechanistic aspects of stem cell biology. Intriguing examples are given by the adult-born neurons generated from the immune system and then traveling to the neurogenic niche via the circulatory system in the crayfish brain (Beltz and Benton; Simões and Rhiner), or the heterogeneity of neoblasts, putative stem cells, in flatworms enabling the regeneration of the entire brain (Brown and Pearson). Yet, the main message from the comparative approach to adult neurogenesis is that the relative exclusive focus on laboratory rodents can result in a bias on how we think about this biological process. For instance, promising neuroprotective treatments developed in rodent models can fail in preclinical trials, and animal models with gyrencephalic brains might be necessary to study the behavior of neuroblasts in large white matter tracts (Taylor et al.). The bias is well-illustrated by the article of Faykoo-Martinez et al. : “species-specific adaptations in brain and behavior are paramount to survival and reproduction in diverse ecological niches and it is naive to think adult neurogenesis escaped these evolutionary pressures. A neuroethological approach to the study of adult neurogenesis is essential for a comprehensive understanding of the phenomenon.” Indeed, interactions of adult neurogenesis with neuroethological traits such as migration and mating behavior in snakes (Lutterschmidt et al. ), territoriality in lizards (LaDage et al. ), sociality and social interactions in mole-rats, birds, and sheep (Barkan et al. ; Lévy et al. ; Oosthuizen), or migratory lifestyle in birds (Barkan et al.) are presented here. The complexity of interactions is, to date, more an obstruction than a help in terms of publishability, but as Faykoo-Martinez et al. put it “most of us are guilty of making strong assertions about our data in order to have impact yet this ultimately creates bias in how work is performed, interpreted, and applied.” Such concerns are confirmed by the finding of remarkable reduction of adult neurogenesis in some large-brained, long-living mammals, including humans and dolphins (Sanai et al., 2011; Sorrells et al., 2018), as reviewed and discussed in the article by Parolisi et al. More and more comparative data strongly support the view that adult neurogenesis is maintained in evolution only depending on strict relationships with its functional need(s). E.g., olfactory systems, mostly linked to paleocortical-hippocampal structures, were important in early mammalian evolution working as a reference system for spatial navigation for the location of food sources and mates, then replaced/integrated by the expansion of the isocortex as a “multimodal interface” for behavioral navigation based on vision and audition (Aboitiz and Montiel, 2015; see article by Parolisi et al.). The complex evolutionary aspects of adult neurogenesis role(s) and age-related reduction in mammals are addressed in the contribution by Hans-Peter Lipp. The main message of this opinion article is that no simple explanations can be called upon on such topic, a heavily actual conclusion even 30 years after neural stem cell discovery. Animal models other than laboratory mice are by no means “out-of-reach” for advanced techniques, and the following examples could encourage and facilitate creative thinking in terms of research questions and how to approach them. Lindsey et al. present a thorough step-by-step protocol for visualizing cell proliferation in the whole zebrafish brain in 3 dimension. LaDage et al. used hormonal implants in lizards to study the interaction of testosterone and neurogenesis on territorial behavior. In fish and birds, Neurobiotin or lentivirus can be used to trace and characterize newly born neurons (Kosubek-Langer et al. ; Olivera-Pasilio et al. ), and Brown and Pearson summarize the single-cell genomic data collected in planaria. Ideally, studies in laboratory rodents and non-conventional animal models can support and foster each other. For example, increased neurogenesis in laboratory mice confers stress resilience mediated by the temporal hippocampus (Anacker et al., 2018). Strikingly, wild rodents, naturally exposed to high stress levels, show more neurogenesis in the temporal hippocampus than the commonly used laboratory mouse C57BL/6 (Wiget et al.). Similarly, Reyes-Aguirre and Lamas identified the mechanism why the mouse retina cannot regenerate after damage, much in contrast to what has been reported in fish (Raymond et al., 2006). Finally, by using meta-analyses and a model to compare the neurodevelopmental sequences of different mammals, Charvet and Finlay try to put in a common time frame the envelopes of hippocampal neurogenesis, in order to interpret them in species with highly different lifespan. In conclusion, with this Research Topic we strongly assert that adult neurogenesis research cannot rely exclusively on laboratory rodents, as each animal model can only cover certain aspects of the various flavors in which neuronal stem cells and their progeny in the postnatal brain can behave. The papers presented here emphasize the value of “… taking a step back and actually placing our results in a much larger, non-biomedical context, …[helping]… to reduce dogmatic thinking and create a framework for discovery” (Faykoo-Martinez et al.). After all, the failure of many clinical trials based on pre-clinical studies carried out on mice (Lindvall and Kokaia, 2010; Donegà et al., 2013), do confirm the need for investments in comparative medicine (specifically on brain structural plasticity, see La Rosa and Bonfanti, 2018). A comparative view can indeed foster a more careful interpretation of the final impact of the biological process of neurogenesis in brain functioning and animal behavior. Donegà, M., Giusto, E., Cossetti, C., and Pluchino, S (2013). “Systemic neural stem cell-based therapeutic interventions for inflammatory CNS disorders,” in Neural Stem Cells: New Perspectives, ed. L. Bonfanti (Rijeka: INTECH), 287–347. BACKGROUND: Intermittent theta burst stimulation (iTBS) was widely used in stroke rehabilitation and was more efficient than repetitive transcranial magnetic stimulation in terms of inducing larger motor evoked potential and producing longer effects. To our knowledge, the outcomes are not available combining rehabilitation and iTBS for improving motor function of lower extremities in patients with stroke. AIM: To evaluate the feasibility and effectiveness of intermittent theta burst stimulation aiming to stimulate bilateral leg motor cortex and promote functional improvements. DESIGN: A single blind, randomized controlled pilot study. POPULATION: Twenty patients with chronic stroke finally enrolled for analyzed. METHODS: Participants were randomized into two groups to receive 10 sessions of iTBS group and sham group over a 5-week period. The iTBS was delivered over the midline of skull to stimulate bilateral leg motor cortex. The outcome measures included balance, mobility, and leg motor functions were measured before and after interventions. RESULTS: Within-group differences were significant in the Berg Balance Scale for both groups (Z=-2.442, P=0.015 in iTBS group; Z=-2.094, P=0.036 in sham group), in the Fugl-Meyer Assessment (Z=-2.264, P=0.024) and Overall Stability Index of Biodex Balance System of iTBS group (Z=-2.124, P=0.034). However, no significant between-group differences were found. CONCLUSIONS: There was no powerful evidence to support the effectiveness of iTBS group better than sham control group. Some essential technical issues should be considered for future studies applying iTBS to stimulate bilateral leg motor cortex. CLINICAL REHABILITATION IMPACT: iTBS combined with stroke rehabilitation are probably expected to be useful for promote brain plasticity and functional performance but some technical issues should be carefully considered. Like any other muscle in your body, when it comes to your brain, you either use it or lose it. To keep your cognition strong and to help set yourself up for successful aging, it’s important to create growth experiences for yourself that build up your neuroplasticity. Too often I meet seniors who’ve lived a life of duty, where they dedicated their lives to the hustle bustle of work, family and responsibilities. This is a completely honorable commitment. The main fallback is… your dream list of meaningful goals oftentimes gets trapped in a hope chest and by the time retirement hits, maybe you’ve not only lost sight of your dream list but you’ve also lost interest in creating meaningful challenges for yourself. One of the ways to increase your neuroplasticity is to create new and exciting challenges for yourself, and the way to create new and exciting challenges for yourself is to set meaningful goals. What’s the best way to set meaningful goals? Find clarity through some serious self-reflection. This can really help you uncover some of the passions that you have deep inside you, which ultimately can help create some of your most vibrant new neural pathways in your brain. Once you have your meaningful goals, a powerful way to chase them and to keep your brain activated is to adopt a growth mindset. A growth mindset is based on Dr. Carol Dweck’s idea that you can “grow your brain’s capacity to learn and solve problems.” It’s a perspective that believes you’re not born either smart or not-so-smart, but instead you’re born with the ability to learn. It takes work. A critical ingredient of adopting a growth mindset is to embrace challenge. When we’re faced with any pitfalls and “fails” in life, especially when we’re willing to try something new and exciting, it’s easy to give up and run away from any challenges or roadblocks. If you can learn the skill of learning and train yourself to look forward to those hard and challenging moments, you’ll be that much more likely to accomplish any of your personal goals. The most important takeaway from using micro-steps is that you want to get in the habit of being consistent in tackling each one. In order to make lasting changes in your brain pattern, you need to be diligent about giving yourself a learning process. Continue to challenge yourself on a regular basis. If setting and achieving new meaningful goals can become habitual, that’s when the neuroplasticity magic can happen for you. According to Roberts Wesleyan College, you make nearly 35,000 decisions a day, which means a ton of those decisions are made while your brain is on autopilot. If you can learn to engage the decision-making part of your brain, your prefrontal cortex, you can increase your neuroplasticity. A way to do this is to practice mindfulness so that you’re more self-aware and more likely to make value-based(vs autopilot) decisions throughout the day. Researchers Bas Verplanken and Rob Holland found that people make value-based choices only when those values are cognitively activated. Your circle of influence is everything when it comes to how your daily habits are impacted. You become who you most spend time with so be sure to align your social circle with your personal goals and good habits. By surrounding yourself with like-minded people who care about the same meaningful things that you do, you’re much more likely to continue to conquer your goals and expand your growth experiences. This is what’ll keep your neuroplasticity built-up and strong. Tip: Spend less time with people in your area of concern, which is the area that highlights negativity, gossip, the news, the stock market, drama, regrets, fear, etc. So there you have it – five practical tactics that’ll help you build up your brain health and neuroplasticity. Which secret will you tackle first? How will you continue to create new and meaningful growth experiences for yourself? [WEB SITE] VR could trick stroke victims’ brains toward recovery. Could virtual reality help stroke survivors regain motor function? That’s a question Sook-Lei Liew is looking to answer. Liew, an assistant professor at the University of Southern California and an affiliate of the Stevens Neuroimaging and Informatics Institute at the Keck School of Medicine, was inspired by research from Mel Slater and Jeremy Bailenson on embodiment in VR. If someone’s given a child’s body in VR, for example, they might start exhibiting more childlike behavior. She wondered if giving stroke survivors with motor impairments a virtual avatar that moves properly could help promote brain plasticity (or the ability to change) and recovery. Maybe it would eventually lead to them to moving an impaired limb again. Virtual reality is a computer-generated simulation of a 3D environment. Using a VR headset with lenses that feed images to the eyes, a person can be virtually transported to another location, or interact with a setting in a seemingly realistic way. It’s commonly been used in gaming, but it’s being tested in other environments, too — like rehab. Implementing VR in health care and patient treatment isn’t new. It’s been used to help people overcome phobias and anxiety disorders. But the application is starting to take off now that the technology is more developed and commercially available. Some medical schools are looking to train students with virtual simulations, and it’s even helping midwives learn how to deliver babies. Liew’s research team has been working on a study for about two years called REINVENT, an acronym for Rehabilitation Environment using the Integration of Neuromuscular-based Virtual Enhancements for Neural Training. The researchers also collaborated with the USC Institute for Creative Technologies to develop the prototype. The process works by using a brain-computer interface, which takes a signal from the brain and uses it to control another device: a computer, a robot or, in REINVENT’s case, an avatar in VR. Next, researchers read electrical signatures of brain activity from the surface of the scalp using electroencephalography, or EEG, for short. The team also uses electromyography, which studies the electrical activity of the muscles. That can tell them whether somebody’s moving or if they’re trying to move. While the researchers could theoretically extend this process to a patient’s lower limbs, Liew said it can be dangerous for someone with a motor impairment in the lower extremities to try to move with VR, so seated studies are much safer. The research group recently finished testing the prototype using an Oculus DK2 with 22 healthy older adults, who provided a sample of what the brain and muscle signals look like when they move. They’re now starting to test with stroke patients in a controlled lab setting, aiming to work with 10 in the short term and hundreds in the long term, in both clinical and home environments. The team also found that giving people neurofeedback of the virtual arm moving in a VR headset was more effective than simply showing it on a screen. Because VR is still a relatively new technology, there are many unanswered questions on the best ways to use it in the medical profession. And while the possibilities for VR in health care are exciting, Liew is careful not to get ahead of herself. Only time — and plenty of research — will tell. Nitric oxide (NO) is one of the most important signal molecules, involved in both physiological and pathological processes. As a neurotransmitter in the central nervous system, NO regulates cerebral blood flow, neurogenesis, and synaptic plasticity. The aim of our study was to investigate the effect of the extremely low-frequency electromagnetic field (ELF-EMF) on generation and metabolism of NO, as a neurotransmitter, in the rehabilitation of poststroke patients. Forty-eight patients were divided into two groups: ELF-EMF and non-ELF-EMF. Both groups underwent the same 4-week rehabilitation program. Additionally, the ELF-EMF group was exposed to an extremely low-frequency electromagnetic field of 40 Hz, 7 mT, for 15 min/day. Levels of 3-nitrotyrosine, nitrate/nitrite, and TNFα in plasma samples were measured, and NOS2 expression was determined in whole blood samples. Functional status was evaluated before and after a series of treatments, using the Activity Daily Living, Geriatric Depression Scale, and Mini-Mental State Examination. We observed that application of ELF-EMF significantly increased 3-nitrotyrosine and nitrate/nitrite levels, while expression of NOS2 was insignificantly decreased in both groups. The results also show that ELF-EMF treatments improved functional and mental status. We conclude that ELF-EMF therapy is capable of promoting recovery in poststroke patients. Cardiovascular diseases, including ischemic stroke (IS), are a serious problem of the modern age, killing 4 million people each year in Europe . Stroke is caused by ischemia of brain tissue. Brain structure damage occurring during ischemia/reperfusion is due to the generation of significant amounts of reactive oxygen species and inflammatory mediators . Damage to brain tissue as a result of a stroke cannot be undone. However, the most important part of poststroke therapy is immediate and long-term rehabilitation, considering the enormous plasticity of the brain . Although extremely low-frequency electromagnetic field (ELF-EMF) therapy is not a standard treatment in the poststroke rehabilitation, some authors suggest its increased positive effect on patients . ELF-EMF treatment is based on regeneration, osteogenesis, analgesics, and anti-inflammatory action. Its biological effect is related to processes of ion transport, cell proliferation, apoptosis, protein synthesis, and changes in the transmission of cellular signals . The regenerative and cytoprotective effect of ELF-EMF is based on mechanism associated with nitric oxide induction, collateral blood flow, opioids, and heat shock proteins . Nitric oxide (NO) is an unstable, colourless, water-soluble gas with a short half-life (3–6 sec). The compound has one unpaired electron, which makes it a highly reactive free radical. It is characterized by the multiplicity of action in the body, in both physiological and pathological conditions . Synthesis of NO in the organism is catalysed by nitric oxide synthase (NOS), occurring in three isoforms: neuronal (nNOS), inducible (iNOS), and endothelial (eNOS), encoded by different genes whose expression is subject to varying regulation. The constituent isoforms of NOS are eNOS and nNOS, whose activity is associated with concentration of calcium ions and the level of calmodulin in a cell, as well as with hypoxia, physical activity, and the level of certain hormones, that is, oestrogens . In contrast, because it is closely related with the calmodulin, iNOS does not require a high concentration of calcium ions but is regulated by various endogenous and exogenous proinflammatory factors . The two-stage synthesis of NO consists of the oxidation of L-arginine to Nω-hydroxy-L-arginine and, under the influence of NOS and oxygen, formation of L-citrulline and release of NO. All isoforms of NOS require the same cofactors: nicotinamide adenine dinucleotide phosphate (NADPH), flavin mononucleotide (FMN), flavin adenine dinucleotide (FAD), tetrahydrobiopterin (BH4), iron protoporphyrin IX (heme), and O2 . Nitric oxide is one of the most important signal molecules, involved in both physiological and pathological processes. One of the major functions of NO is as a potent vasodilation, increasing the blood flow and regulation of blood pressure, which has been used in clinical practice for many years. Deficiency of this compound is observed in various disorders of many systems: cardiovascular, gastrointestinal, respiratory, and genitourinary . The beneficial effects of NO lie in its platelet inhibition, macrophage cytotoxicity (antibacterial, antiviral, and antiparasitic), and protection of the mucosal lining of the digestive system. On the other hand, excessive expression of iNOS can be disadvantageous, for example, during sepsis. The adverse action of NO is associated with the production of superoxide anions and subsequent generation of peroxynitrite and hydroxyl radicals, which are highly toxic . In the central nervous system, NO as a neurotransmitter regulates cerebral blood flow, as well as neurogenesis and synaptic plasticity. Furthermore, neuronal death is caused by high concentrations of NO by caspase-dependent apoptosis process and promotion of inflammation. Elevated levels of nitric oxide promote necrosis by energy depletion. On the basis of these mechanisms, NO is involved in the etiology of many neurological diseases, such as major depression, schizophrenia, epilepsy, anxiety, and drug addiction . The concept of a changing brain has replaced the formerly held belief that the adult brain was pretty much a physiologically static organ or hard-wired after critical developmental periods in childhood. While it’s true that your brain is much more plastic during the early years and capacity declines with age, plasticity happens all throughout your life. I know the power of neuroplasticity first hand, as I devised and performed my own home-grown, experience-dependant neuroplasticity based exercises for years to recover from a brain injury, the result of a suicide attempt. Additionally, through extensive cognitive behavioral therapy, meditation, and mindfulness practices, all of which encourage neuroplastic change, I overcame depression, anxiety, and totally revamped my mental health and life. The optimal conditions inducing proper brain activation during performance of rehabilitation robots should be examined to enhance the efficiency of robot rehabilitation based on the concept of brain plasticity. In this study, we attempted to investigate differences in cortical activation according to the speeds of passive wrist movements performed by a rehabilitation robot for stroke patients. 9 stroke patients with right hemiparesis participated in this study. Passive movements of the affected wrist were performed by the rehabilitation robot at three different speeds: 0.25 Hz; slow, 0.5Hz; moderate and 0.75 Hz; fast. We used functional near-infrared spectroscopy to measure the brain activity during the passive movements performed by a robot. Group-average activation map and the relative changes in oxy-hemoglobin (ΔOxyHb) in two regions of interest: the primary sensory-motor cortex (SM1); premotor area (PMA) and region of all channels were measured. In the result of group-averaged activation map, the contralateral SM1, PMA and somatosensory association cortex (SAC) showed the greatest significant activation according to the movements at 0.75 Hz, while there is no significantly activated area at 0.5 Hz. Regarding ΔOxyHb, no significant diiference was observed among three speeds regardless of region. In conclusion, the contralateral SM1, PMA and SAC showed the greatest activation by a fast speed (0.75 Hz) rather than slow (0.25 Hz) and moderate (0. 5 Hz) speed. 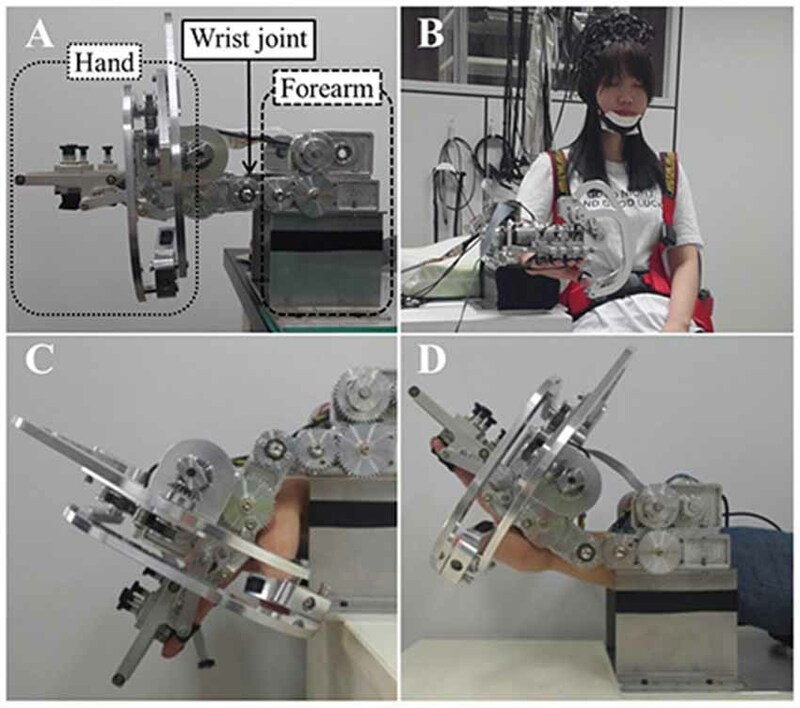 Our results suggest an optimal speed for execution of the wrist rehabilitation robot. Therefore, we believe that our findings might point to several promising applications for future research regarding useful and empirically-based robot rehabilitation therapy.